Every year, as summer draws to a close, the AU Black Alumni Alliance chooses its Book Award recipient. This year's pool of nominees included students so talented, so engaged in their communities, and with such high academic achievement that the selection committee could not help but name two winners. 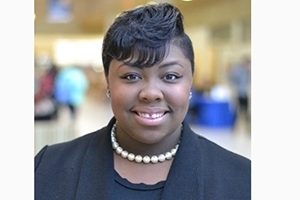 While exceptional in countless ways, 2017 AU BAA Book Award recipients Autumn Grant, SPA/BA '19, and Justin Simms, Kogod/BSBA '18, are similar in that they both have a strong track record of service and have proven their commitment to Black, African-heritage, and Caribbean communities by promoting student engagement at AU and beyond. Today we would like to introduce you to one of our recipients, Autumn Grant. AU: Congratulations! You've already proven yourself to be an exceptional young professional, but I'd like to know a bit more about the young woman who has made it to this point. Could you tell us a little about yourself? Autumn: I grew up in Baltimore with my mother, two younger brothers, and extended family. My mother is my biggest motivation because she worked hard on her own to raise me and my brothers into exceptional young people. Family was a huge part of childhood because we were so close. My family is also very religious, so the church was also a huge influence on my upbringing. The church is where I met most of closest friends and people I can call family. I am a silly, fun person who loves to laugh. Often, I describe myself as an optimist. I am a helper. I love to help people in every possible way I can. One of my dreams is to travel to all the continents. I value diversity, and I believe there is something to learn from every part of the world. AU: How did you choose American University? Autumn: Growing up I was always politically oriented and so my dream was to be in DC. I wanted to study political science and attended a school that focused heavily on politics. While doing my research, I learned that AU had a good political science program, which also offered a lot of opportunities. At my visit, I fell in love with the campus and the atmosphere. The people here were so welcoming and nice, especially those that coordinated my visit. I visited two more times following my first visit and participated in a few events, which I really enjoyed. That's when I decided AU was the place for me. AU: In what organizations are you involved on and off campus, and what positions do you hold? Do let us know about your internship, as it sounds really interesting. Autumn: Since I've been at AU, I was always involved. I have held many rewarding positions on campus. I was the Senator of class of 2019 in the Student Government, and now I am the [student] director of accessibility for the AUSG President's Cabinet. I was appointed vice president of recognition for Anderson Hall, vice president of finance for East Campus, and vice president for Sister Sister. Now I am a Resident Assistant. I am also an Ambassador for the School of Public Affairs, and my job is to represent students in SPA and speak with prospective students. Off campus, I am a Collegiate Ambassador for Black Girls Vote, Inc. This is a grassroots non-profit organization that engages, educates, and empowers women of color to use their political rights and be involved in their communities. AU: What is your endgame plan? Where would you eventually like to end up, personally or professionally? Autumn: Immediately after undergrad, my plan is to attend law school or go to grad school for a degree in Public Administration. I aspire to be a federal legislator. I want to be on Capitol Hill representing my community. I believe the only way we can help minorities and poor is to have minorities and people that share similar backgrounds. I want to be a legislator because I know they have the power to help and make changes, and that is my dream. I want to help, make a change, and influence my people. I will use the office for a good cause while sticking to my morals. AU: Is there anyone whom you would like to thank for helping you get to where you are today? Autumn: First, I would like to thank my mother and grandmother for being my biggest supporters. I would also like to thank my mentors because they taught me a lot and most of my experiences and internships came from them. I would also like to say a big Thank You to my alumni mentors, LaTanya Sothern and Jolene McNeil, for being mothers away from home.